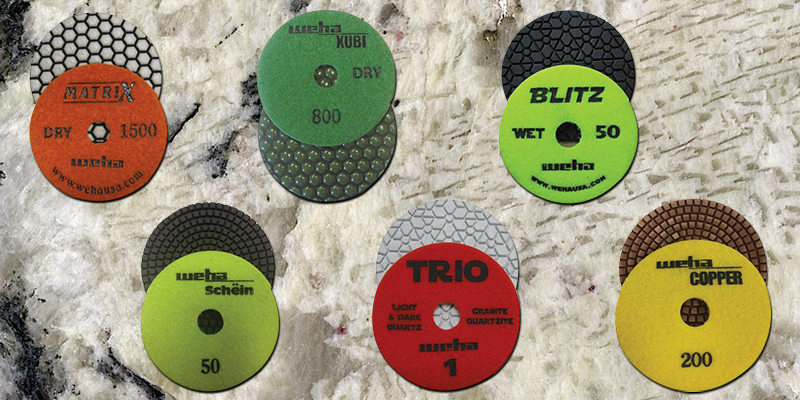 If you were to go into 20 fabrication shops, you would find a variety of polishing pads. So why are there so many different kinds? Because not all stone is the same, not all production environments are the same, and fabricators are not all the same. Each of these factors have variants as well. That means there are many factors that can affect which pad is needed at any given time. Let’s take a look at some examples. Although listed last, it is certainly not the least important. The type of material that is being polished will determine what features the polishing pad needs to have. For instance, does the fabricator work with a lot of granite? Does the shop process primarily marble? The kin of stone that is being worked will influence the decision. Additionally, the type of work being performed on the stone will contribute to the polishing pad selection. For example, is the task surface polishing? What about edges, corners, profiles? As you can see, the need for specialty pads becomes evident quickly. This site is meant to be a resource for anyone looking for information about polishing pads and what they are used for. So look around and see what there is to find.